This post continues on two other articles about vintage multipencils. (The Faber-Castell 33/78 four colour pencil and the Caran D’ache Tricolor.) I mentioned their quality construction, as well as the relative complexity of their mechanisms. Well, I got further with them than I did with the Caran d’Ache 45. The 45 was advertised online as a multipencil, but when it arrived, it turned out to be a multipen – three ballpoints and a pencil in a classic looking barley pattern housing. Octagonal shaped, each writing implement is selected by sliding a corresponding switch. The implement is retracted by clicking the cap. So now the fun starts. First the obvious. I can’t find any way to advance or replace the pencil lead, and suspect it is all manual. That’s okay – at least it works. Now the ballpoints – they are dried up. Easy to replace, right? Unfortunately, no. 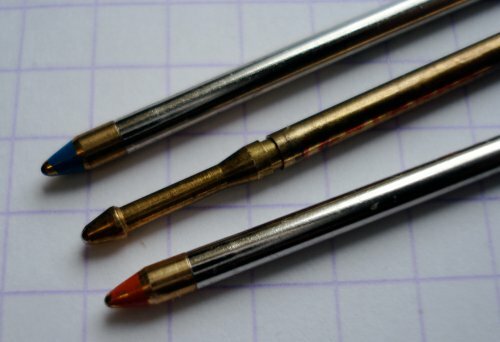 There seems to be a standard mini-ballpoint format that is used by pocket pens and multipens, but it has two differences from the 45’s format. First, the modern format is longer – which can be remedied with a side-cutter. But, the 45 is a clutch leadholder on the inside, and it wants the format of the original. The 45 does not properly grip the new format. So, I fear this potentially amazing writing instrument is a paperweight, unless someone out there has some ideas for finding a replacement ballpoint refill. This post is also a cautionary tale about proprietary formats for writing implement refills – pen, pencil, or other. Well it’s a mighty nice looking find, as a paperweight or as a writing instrument. I’ve wondered what would be involved in refilling an existing ball-point tube. You’d need some solvent that would clean out the old but not damage any plastics (or be corrosive to the metals). Maybe an ultrasonic cleaner or syringe-type sprayer. Fresh ink and a way to put it in the tube—Maybe a long needle syringe inserted all the way up to the ball and continuously dispensed as it is retracted, until the ink tube is filled to the right level? The ink is viscous enough to probably require an enormous needle diameter so it would be possible to squeeze the syringe. I have the exact same multipencil – in gold and it is a 47. If you ever find out where to get the refills, PLEASE do inform me! Wondering whether anyone has found ballpoint refills for this pen, or whether anyone has had any success modifying other manufacturers’ refills to fit this pen. Ho anch’io la bellissima penna multicolore,è la 46 in argento. Tempo fa ho mandato una e-mail alla CARAN D’ACHE richiedendo i refill di ricambio e non ho ricevuto nessuna risposta.Per una penna così prestigiosa , la ditta, dovrebbe rimettere in produzione i refill di ricambio perché, come me,in giro per il mondo ce ne dovrebbero essere ancora molte.Forse unendo tutte queste lamentele e facendo pressione alla CARAN D’ACHE si potrebbe ottenere un buon risultato. My Italian is not excellent, but if I understand you correctly, you want as many people as possible to ask Caran D’ache to produce refills. If you start an action, I am highly interested, since I have the same problem. I have my father’s silver Multi pen 45. Same problem solution? Contract replacement refills with China. If we can get a big order in place , we can do it???? I just found out, that mine is a “47”. If it takes the same refills – I am with you and our order! Let me know if you get enough interest re ordering some refills. Actually these refills are available through Caran d’Ache customer service in Switzerland (not elsewhere). Not inexpensive and 12€ for shipping but OEM quality. Contact their customer service on the (Swiss) website. Very responsive in my experience. 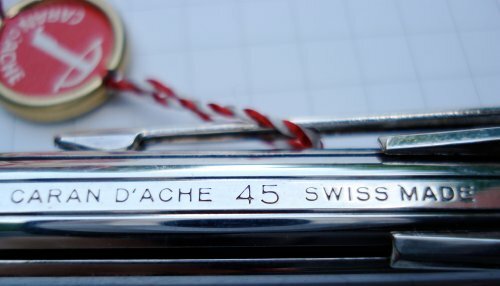 I write to Caran d´Ache in Switzerlans. They don´t replay me. Is normal thi behaviour? Which is the type of mine the pencil? 1.1 ,1.2 , 1.3? My 45 model is for three different colored pencil leads and one ballpoint refill. I have no problem advancing the lead by simply turning the “clutchng” part that holds the lead and this advances the lead in or out. On mine only one of the sliders is for a ballpoint refill. And I cannot get my refill to eject from the pen. Although I’m afraid that even if I did, I will have the same problem everyone else does in that there doesn’t seem to be a refill match for this pen/pencil. Previous PostPrevious No back to school pencils? Next PostNext What’s that pencil made of?